Why Should it be Hard To Fall in Love??? Why should we have to work so hard to get love / bhakti ? So much service and so many rules and still Krishna prema doesn’t come! I feel at odds with the entire concept that love should require work / sādhana. Love cannot be earned, or purchased by any amount of work. In this world nobody does sādhana to fall in love, it just happens naturally. Why should we have to work and “earn credits” to be able to fall in love with supreme lover? In the opening chapter of Mādhurya Kādambinī, Śrī Viśvanātha elaborates on the same point, quoting Bhāgavatam extensively to demonstrate that love cannot be created, it manifests by free will, its own free will – yadṛcchayā. Nothing causes love except love: bhaktyā sañjātayā bhaktyā (11.3.31). Then what is the point of sādhana??? Think about how love works. You meet someone, or see their picture, or hear about them and then all the sudden, bazoom, you are in it… you’re in love. More precicely, love descends upon you like a wave and completely drowns your existence in it. Why shouldn’t Krishna prema come in the same manner? But think about it again, there are at least two very important difference between falling in love with Pamela Anderson and falling in love with Sri Krishna. For one thing – The nature of the “love” we fall in with Pam isn’t very special. It’s very common, basic – essentially just an intensified form of “liking” something, as in feeling great pleasure from something. 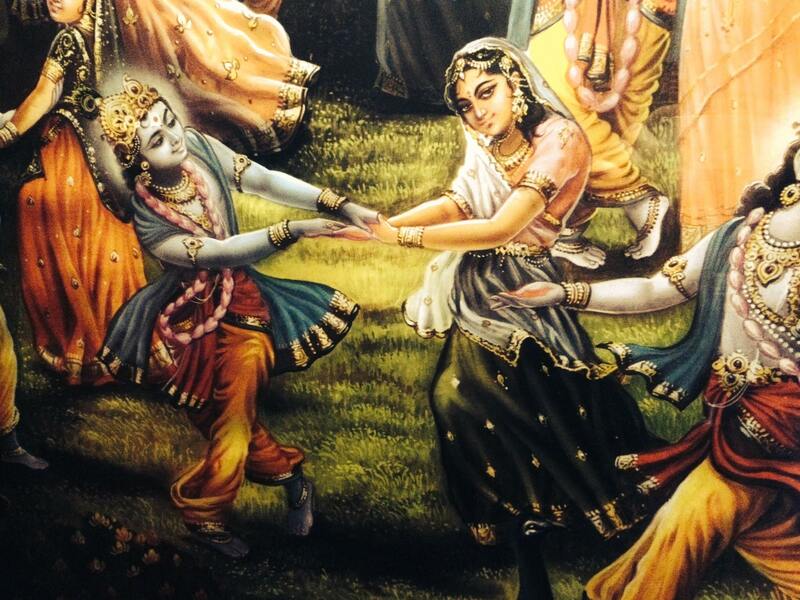 But Krishna prema isn’t the same type of love at all. It’s very uncommon because it has absolutely no laxity. It absolutely devours the consciousness, leaving no room at all for anything else to even exist (sandrānanda viśeśātmā, BRS 1.1.38~40). It absolutely incinerates all self-centered concerns and separatist selfishness. So its not the same as the love we fall in everyday. Its like the difference between a penny and a hundred dollar bill. Yes, they are both money, but not quite the same amount of it. The second difference is the beloved. Pam Anderson exists as an object of the five senses in the external world of bhinna-prakṛti which our mind and senses can easily grasp. However, the subject of Krishna prema, Krishna – although permeating Pam Anderson and every other object and subject in the external field – is not wholly contained in any of those objects that we can readily experience. (See Gita 7.12, for example, “matta eveti tan viddhi, na tv aham tesu te mayi.”). We can hang out on Rodeo Drive in Beverly Hills and maybe run into Ms. Anderson, or at least we can watch a Baywatch episode or whatever – but how will we experience the beauty of Krishna directly? He is the root of the very consciousness which is attempting to find him. His is behind the eyes that are looking outward. Our eyes don’t point in the direction where he exists (we are bahir-mukha, not antar-mukha). How then will we see his beauty, hear the actual sound of his name, smell his fragrance, etc? And if that is not possible, how will we fall in love with him? We cannot fall in love with a person we do not know! Sādhana, then, doesn’t create prema at all (practice/work doesn’t create love) but it makes the heart a place (a) capable of experiencing the most mysterious entity in existence, the supreme root of it all, Śrī Krishna, and (b) capable of hosting and expressing the most intense, all consuming, sublimely intense and incalculably delightful pure love – which is the soma rasa that Sri Krishna drinks incessantly. The “work” of sādhana is (a) the effort to make our eyes capable of looking inward, away from exploitable objects and into the realm of pure consciousness (advaya jñāna) where we encounter first brahman, then paramātmā, then bhagavān, and only at the utmost end root, having absorbed the munificent abundance of karuṇa-kṛpā as saṁvit-śakti, can finally directly discover the Absolute Enchanter (“Krishna”) and Enjoyer (“Rāma”), Sri Bhagavān Hari, Krishna. The “work” of sādhana is (b) to make the rock-hard separatist selfishness that constitutes our current concept of “I” into something meltable, disintegratable, so that the rays of dawning love (bhāva) can melt it and get rid of it, and make the heart capable of experiencing and thus amplifying true prema. In short, although love happens spontaneously and of its own accord – we have to work to be able to even perceive the viṣaya we want to fall in love with (Krishna, the Supreme Root of Reality, paramāśraya), and we have to work to make our externalized, exploitive, separatist “I”-ness into something that can be blown away and replaced by a type of love whose intensity we cannot even estimate. Sādhana doesn’t create love, it creates our capacity for love. The rest happens by magic. Love’s magic. What is sādhana anyway? It itself is love! It is the seed form of love, śraddhā (an inclination of the heart, śrad) Therefore, the effort to make our senses capable of internal perception into consciousness itself, where Krishna resides, is itself an act of love. The effort to chip away the hardened shell of separatist, irrelevant, anartha-“I” is an act of love in itself, just as the clearing of a field is also an act of farming. So, it is certainly only love which generates love, bhaktyā sanjātayā bhaktyā. It is love. If it feels too much like work, we aren’t doing it right. And, very importantly, augmenting this meditation by emotive saṁkīrtan of that nāma-mantra. This process should feel joyful the majority of the time ( susukhaṁ kartum – Gita 9.2), because it is itself the seed form of the supreme joy, krishna-premānanda. Next Why Were We Born This Way?